It is that time of year again as the best bracket racers across North America do battle at racetracks spanning half a dozen states and provinces with the International Hot Rod Association’s thrilling Summit Racing Equipment Team Finals presented by AMSOIL. 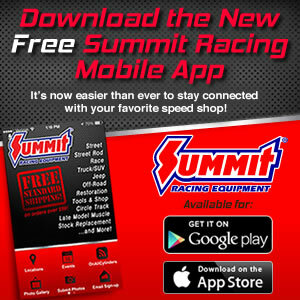 The Summit Team Finals allows IHRA member tracks to send teams made up of their best drivers from the 2014 racing season to race for team and individual championships at their regional Team Finals event. Also at IHRA Team Finals events, the top racers from each track’s Summit SuperSeries program in Top, Mod and Junior Dragster will runoff for the right to travel to Memphis International Raceway to compete at the Summit World Finals in October. This year’s Summit Team Finals schedule spans seven states and Canada beginning this weekend and running through early October. The IHRA season will culminate with the IHRA Summit Racing Equipment World Finals October 10-11 at Memphis International Raceway. The 2014 Summit Team Finals will get underway at Castrol Raceway in Alberta, Canada with the Division 6 Border Bandits competition the weekend of August 15-17. The ever-growing division will welcome racers from across western Canada and the United States for one of the biggest Team Finals events of the season. The Division 5 Thunder competition will take place the weekend of September 12-14 at U.S. 131 Motorsports Park in Michigan, joining the Division 7 Gunslingers Summit Team Finals that same weekend at Caprock Motorplex in Texas. For more information on the 2014 IHRA Summit Team Finals presented by AMSOIL season, visit www.ihra.com.